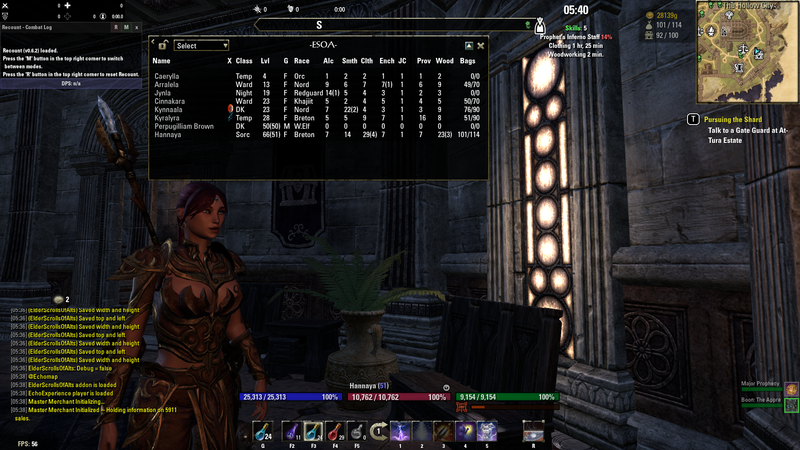 Currently with a moderately looking UI, basic sorting, and at least some of the details I want to store/show. It will probably not hook into changes in realtime, and just update on start, Gui showing and hopefully shutdown. Width of Name field displayed. Added tag viewing commandline "/esoa showentries"
Closing the addon ui closes/cancels the note too. 0.1.12 update info on tooltip for Provisioning and Enchanting having 2 skills that effect what you can make. UI hide on Champion screen, any other needed? Icon will be restored if style is "show2"
With all the below stated, I do wonder if anyone has tried this, or is it only me? The custom view stuff is still beta, but if you get the new version(.07) you can play with it. Go to the settings and select which view you want to edit from the dropdown, "Select View". Or make a new view and use the tags you want using the procedure above. Would it be possible to add a tab "played" where you see the played time for every char and also the total? Would be awesome! Last edited by Echomap : 02/23/19 at 12:23 PM. After not being able to use it for the last week, this last update did the trick for me as well. Minion autoupdated to 1.00.06c, and it seems to be working fine! Many thanks for the quick response! That's just fine, try this new version, 1.00.06c, sorry. I also installed LibStub (1.0 r5) and LibAddonMenu (2.0 r26) also via Minion. Let me know if I can provide other information to help you troubleshoot this! I really appreciate your work on this addon! 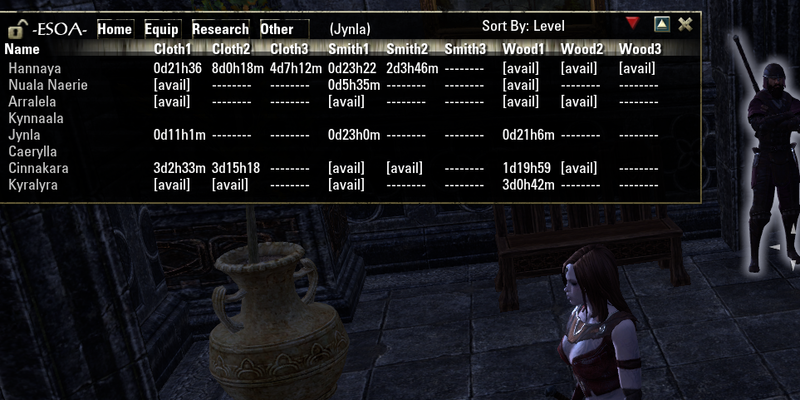 Do you by chance have characters that haven't been read into this addon in a very, very long time? In any case, I hope that 1.00.05 fixes your issue. That was indeed the case, but, alas, the .05 version didn't fix it. I have deleted the related saved variables, it seems to be ok now. 1) I don't want to make you have to do a lot of work to get this running! 2) Do you get errors when you first load a character, every time? 3) Yeah, I was actually looking into displaying the cooldown timer for the special now. It's working very nicely for me now, and this is what I did. Once done, I went back and logged in to the first one. 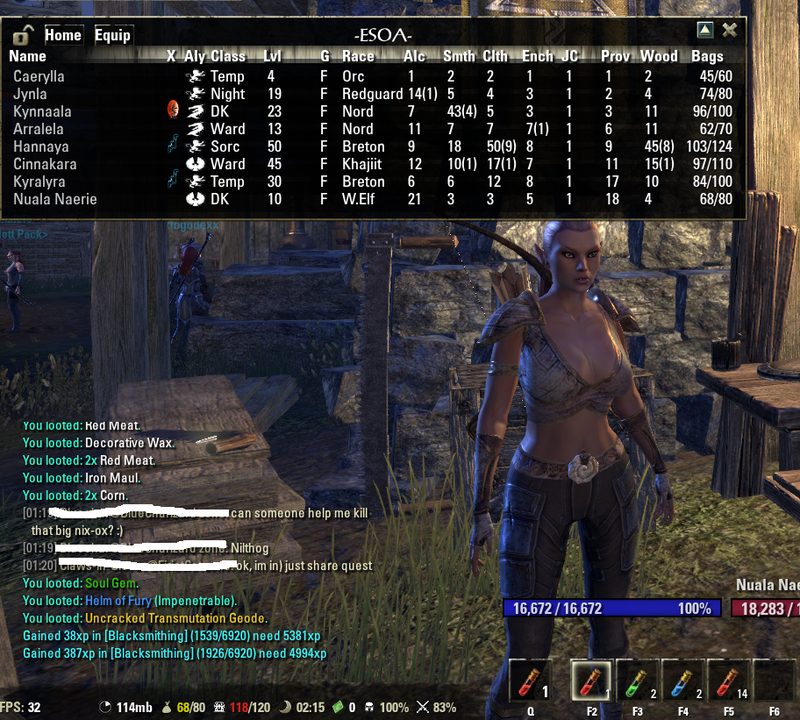 I slash command /esoa, the addon starts with the error window, I dismiss error, then In the upper right, the field that shows either A or ALL, starts with ALL showing and no entries. I click on it, it changes from ALL to A, all the characters now show without any error. (if i click on it to have ALL show, it errors again. I first thought I would need to cycle through all the characters to log the saved variable entries. Now, I'm thinking that there may be a very, very old entry from a character that I deleted, but, entries in the saved variables didn't get cleaned out. Since I have no clue on the syntax of the Lua files, I ain't gonna edit entries manually. Would you consider adding a feature that would show the cooldown timer for the special, Werewolf Vampire? Except for the notes feature, your latest update seems to be working for me. Thanks so much for your hard work. Just ran into another problem. 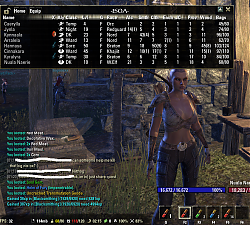 When I type in the /commands /esoa and /ElderScrollsofAlts, it says invalid command. I do not know if that helps. Next I will disable all my addons to see if that makes a difference. The lastest update help you? And no, don't change yourself for me! My characters have long names. It appears that this pushes the columns out past the confines of the table background causing all sorts of problems. There needs to be a limit to how much of a name is displayed for the tables to properly line up. If I had know it would be a problem, I would have picked shorter names for sure. And by the way, I really appreciate your effort! I could never do this on my own, and I really love how it works in general.